One of the most popular ergonomic seats on the market, the Leap Chair, is now available with extra height. It's the Leap Drafting Stool by Steelcase, and it's ready to raise your work (and comfort levels) to new heights. Like the swirls of a fingerprint, no two spines are alike. Always adaptable, the Leap Drafting Stool comes packed with smart ergonomic features like lumbar-saving LiveBack technology and a Natural Glide System, which all adds up more customized support for your unique back. The Leap's lower back control lets you fine-tune its force to provide the right amount and ensure the proper lumbar curve, reducing unhealthy slouching. The chair's upper back control allows you to provide increasing amounts of force as you recline for total support, giving each user, regardless of size, the proper amount of “push back” for the occasion. Special foam construction and slats in the seat and back ensure you're never overheated when seated; upholster yours in exciting fabric options from Steelcase. This award-winning drafting chair provides intuitive adjustments, customized support, and smart design, all in a taller height adjustable package. Overall depth 21.75" - 24.75"
Seat depth 15.5" - 18.5"
Functional seat depth 15.75" - 18.75"
Seat height from floor 22" - 30"
The Steelcase Leap Drafting Chair is available in your choice of a black or platinum. 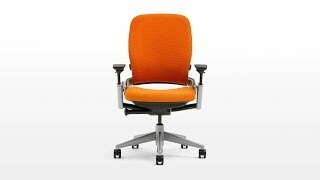 The Steelcase Leap Drafting Chair is available with or without arms. There are some applications where arms get in the way of tasks. For computer users we recommend Steelcase arms because they're some of the best on the market and they can lower to about thigh level. The highly adjustable arms move in and out, forward and back, up and down and pivot, so you can find the exact position for optimal support and comfort. $1,127.00 List Price: $1,789.00* The list price is the same as the MSRP (Manufacturer's Suggested Retail Price). It may not necessarily be the price at which the product is sold.